Let’s banish all images of Mexican food from your head and start over. Forget every taco you have ever eaten or any quesadilla that has ever touched your lips. We’re talking about real Mexican. While you may love tacos and quesadillas, there is so much more to Mexican food than just those dishes! Even then, it is not uncommon for supposedly “Mexican” dishes to take on a very Americanized flavor when served here in the states. For example, the taco here in the U.S. has taken on a completely different persona then a taco you might find elsewhere. So forget everything you think you know about Mexican food, and read on! Alambre off the skewer with tortillas. Alambre: A popular dish of grilled beef, bacon, peppers, onion, cheeses, salsa, and avocado. Literally meaning “wire” in Spanish, all the meat and vegetables in alambre were traditionally skewered then roasted. 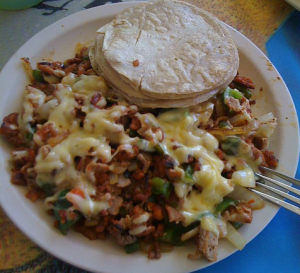 After cooking, the beef mixture is served on corn or flour tortillas. While today you’re likely to see them cooking in a skillet or a flattop grill, the taste is very much the same as the traditional dish. Al Pastor: Al pastor meat is pork marinated in a variety of spices as well as pineapple. The meat is slowly cooked on a vertical rotisserie called a trompo. The juices from the pineapple contain the enzyme bromelain, which helps to break down protein and make the pork tender. Gringas: Made of a flour tortilla with “al pastor” meat, cheese, and pineapple slices. The combination is then grilled in the same manner as a quesadilla. Champurrado: A chocolate beverage that has a base of hot corn and masa. It is a thick and warm drink, and occasionally contains cinnamon, anise seed, or vanilla. Sometimes orange zest, nuts, or even an egg are added to help enrich the beverage. The drink is thickened by hand using a hand whisk until it is frothy. Cochinita Pibil: Originating from the Yucatán Peninsula, this traditional Mayan dish is comprised of meat that has been marinated in very strong citric juices. The marinade results in a very unique flavor that is only accentuated by the banana leaf it is traditionally roasted in. Huarache: Popular in Mexico City, huaraches consist of a masa base that is fried in an oblong shape, and filled with a variety of topping such as potato, salsa, onions, and meats. This dish is named after the shape of the masa, which resembles the shape of traditional Mexican sandal of the same name. If you love Mexican food, or if you are interested in learning more about Mexican food, come visit Casa Blanca Mexican Restaurant in Andover, North Andover, Haverhill, or North Billerica, MA. We pride ourselves on delicious Mexican food!